This pretty crochet lace square is very easy to make. It has a nice open lace stitch in the middle, which makes this ideal for the summer. As for the edge, I worked it in a solid stitch to make it easier for you to add another round of single crochets or double crochets if you want to adjust the size of this lace square. 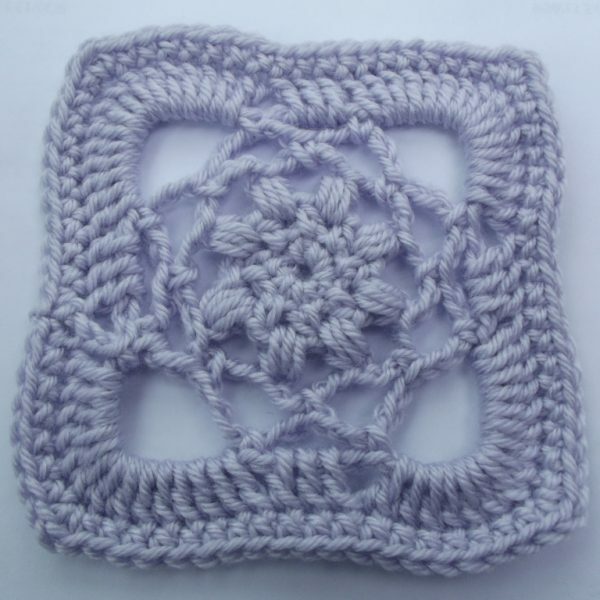 Other similar lace squares include this lacy granny square and this lacy flower square. Materials: Yarn: Patons Canadiana or any similar yarn. Gauge: 2 1/4″ across first 3 rnds. Puff St: (Yo, insert hk in sp indicated, yo and pull through) 3 times, 7 lps on hk. Yo and pull through all 7 lps, ch 1 to secure. Ch 4, join with sl st in first ch to form circle. Note: Make your puff st with the ch-1 to secure, then ch another 3 for a total of 4 chs. Rnd 7: Ch 1, sc in first 7 sts, [(sc, hdc, sc) in next st, sc in next 17 sts] 3 times; (sc, hdc, sc) in next st, sc in last 10 sts. (80 sts) FO.